I think tattoos should mean something. This tattoo means a lot to me. First off, Bob Marley’s Song “Three Little Birds,” “don’t worry about a thing, cause every little thing gonna be alright,” is the phrase that I want to live and think by. Worrying is the thief of joy. 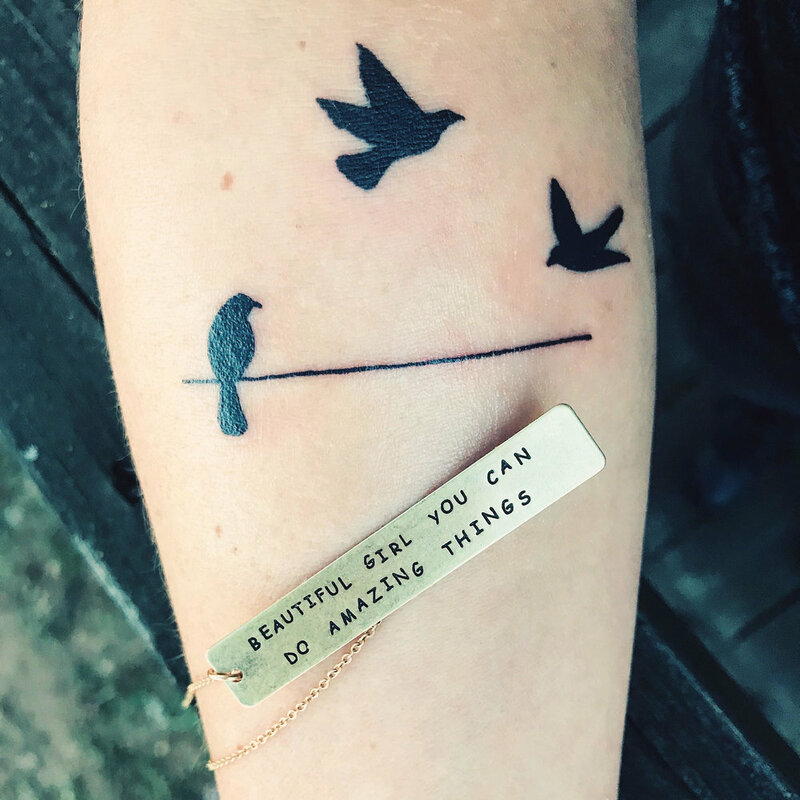 This tattoo reminds me to find the lesson in everything and to trust my journey in life. And have Peace. This tattoo is also in three parts. There is a time to sit and rest and be still, preparing to fly. There is a time to fly and soar. And there is a time to come down. And the cycle repeats for eternity. Also this tattoo reminds me that life is like walking on a wire. You can’t be afraid to fall, you have to trust that you will find your wings. Birds give each other space to breathe. Haven’t you noticed when you see birds sitting together on a wire they never crowd each other. They stay in community but they give each other space to be. I like that. When a bird is on a wire, the electricity does not kill them, it passes right though. That feels like magic to me. And I love to live my life full of magic.